In May 1942, the LV received 100, 50’-6” automobile boxcars from AC&F, under Lot 2337, and numbered as Series 8500-8599. The cars were equipped with end doors and the new round (W) corner design with 5/5 Dreadnaught ends, and had an inside height of 10’-8”. 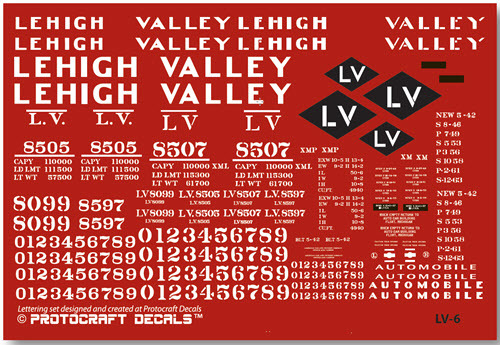 LV 8507, repainted and relettered with 9” lettering and the larger emblem in April of 1964, was one of 40 cars from this series to be assigned to auto parts service. Between 1953 and 1956, 28 cars were assigned to auto parts service and renumbered into 8056-8058, and 8075-8099. Left (auxilary) side door and end doors were welded closed. See image of LV 8099 on reverse side. Paint & Lettering: Cars were painted LV freight car red with a black roof, underbody and truck sideframes. Wheels not painted and allowed to rust and gather road grime.